THE FUTURE looks bright for Droitwich RFC as their record-breaking u16 side hammered Birmingham & Solihull Bees to be crowned North Midlands champions. The cup win at Whitchurch’s Edgeley Park ground also extended their sensational winning sequence which the team started back at u10 level. 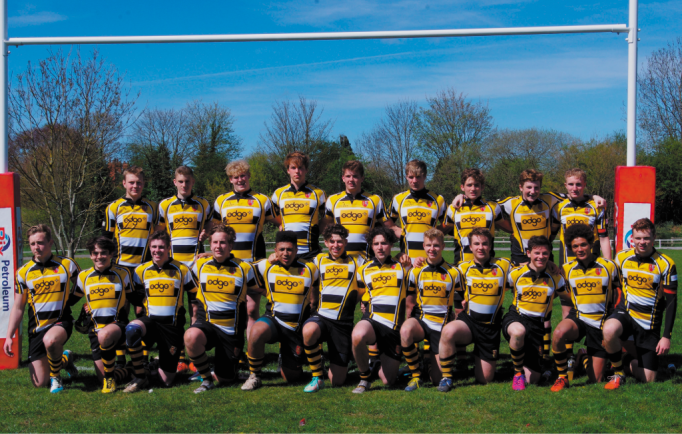 The strength of the competition was highlighted by last season’s beaten cup finalists Worcester Juniors bowing out of the second tier plate tournament at the quarter-final stage. Playing in front of a packed out main stand, the Spa side were under the cosh for the first ten minutes, but pounced on an error to strike with their first attacking opportunity. This early try settled the nerves and two further scores cemented a solid start. At the interval, the Droitwich boys had racked up an impressive 33-0 scoreline and were seemingly out of sight. Bees claimed a consolation try in the second period, but the result was never in doubt as Droitwich went on to claim an emphatic 55-5 victory. Coach Adam Drew said: “Bees battled hard throughout and we were forced to work extremely hard to score our eight tries. “We took our time to settle in the match, but we showed good composure and scored some great tries. “Our record remains intact and that gives me an immense sense of pride for the boys and Droitwich RFC. “We will now re-group ahead of two end of season sevens tournaments before we commence our summer conditioning and fitness programme.